A CTA that can dynamically adapt to the interests and stored qualities of the person viewing it...now that is smart! With personalized campaigns consistently outperforming static campaigns, marketers are calling for additional ways to make website content personalized and relevant for visitors. Dynamic content, with its promises of increased click-through rates and conversion rates, is on marketers’ radar with the National Retail Federation reporting that 53% of retailers planned to focus on web personalization engines in 2012 (National Retail Federation). 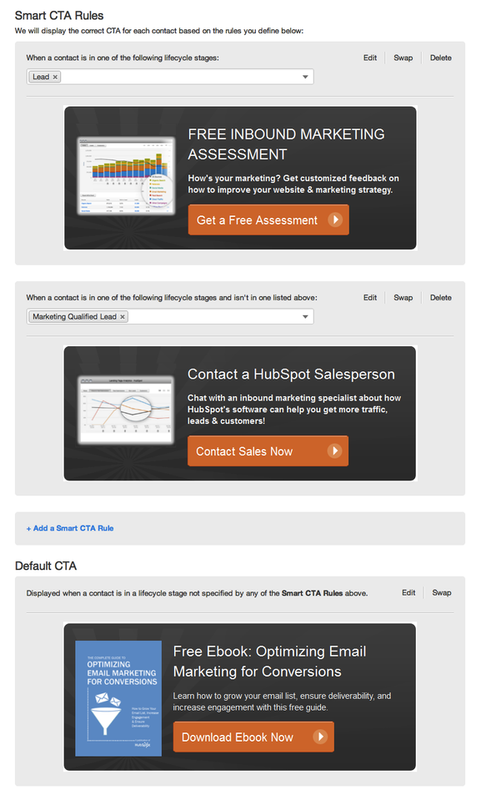 HubSpot has responded with the recent release of HubSpot 3 and the unveiling of the Smart CTA. By leveraging the platform’s new Contacts database, it now allows you to serve different CTAs based on the the viewer’s profile and interaction history with your company. In the example seen here, the Smart CTA can be set to dynamically respond to the person’s current stage in the customer lifecycle. When a person that has been identified as a “lead” visits the site, they will see the “Get a free assessment” CTA while a “qualified marketing lead” viewing the same page will see a “Contact Sales Now” CTA, serving each visitor with the most relevant content based on the decision stage they are in at the moment they visit your site. With the Smart CTA you are now able adapt your CTAs using your segmentation data such as the viewers geographic location, interests and position in the customer lifecycle, allowing you to deliver the right content, to the right person at the right time! Stay tuned. Coming soon we will be detailing HubSpot’s new Social Media features.